106. AMUNDSEN AND PEARY. Issued by ?. (Date?). Unnumbered label from a set of 12. Size: ?. Recto: 3 cards from a set of 12, these being the only polar ones. Two of the 3 relate to Amundsen, both showing a Norwegian flag. 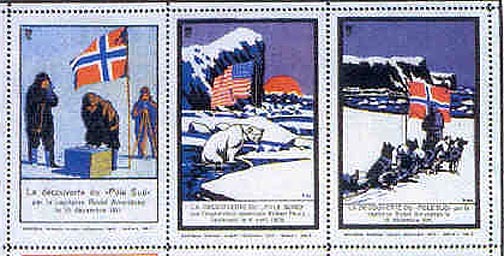 The center one shows a polar bear and an American flag and relates to Peary. There is text at the bottom of each label but it cannot be read.